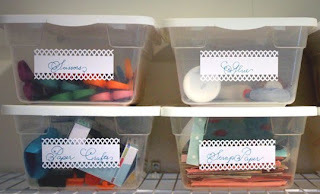 The other day I complained to my husband that I was unable to find pretty, inexpensive labels for my craft supply containers. In a rare moment of (very unexpected) crafting genius he suggested that I buy plain white cheapo labels and use my new craft punch to dress them up. Brilliant! 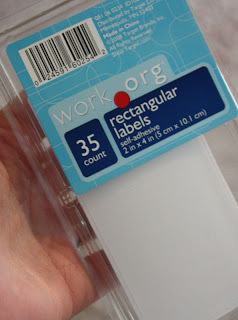 You could also print your labels before punching instead of hand-writing. Thanks, honey! You're the best! Oooooh! Those are pretty! What a great idea! And hubby helping awesome! Wow! Those are some seriouslly pretty labels! What kind of craft punch did you use? Love those! Such a simple thing to do and they turned out awesome! Thanks so much for the tip. Great use for those punches! Thank you for sharing this idea; I love it! I'm always surprised at the great home decor ideas that my guy gives me :). What a great idea! Where did you buy your craft punch? I've been pricing them lately ~ was yours around $13? Thanks everyone! It's a Martha Stewart punch (called lattice something I think?). I bought it at Hobby Lobby and it was right around $14, but I used a 40% off coupon + a gift card I got for my birthday. 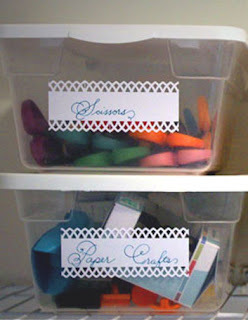 That's so pretty I almost want to take the doors off my craft cabinet just so I can copy you! And the label punching turned out great! They look great and your husband is great for helping. I love a good man...I have one!! how awesome. i would pay for those!! !